Setting a goal to live a healthier lifestyle is probably one of the most common New Years Resolutions that people make for the year ahead and strive to achieve throughout the next 12 months. Typically this type of resolution focuses on goals such as eating healthier or quitting unhealthy habits like tobacco use. Although your oral health may not be the first idea that comes to mind when you make a resolution to live a healthier lifestyle, we urge you to consider giving it some thought. Since both of the aforementioned goals have an impact on your oral health, your dental care professionals can help motivate you to stay on track. Getting on a regular dental check up schedule can help you maintain better overall health and go along hand in hand with achieving your ultimate goal. During your regular dental cleaning and check up visits, your dental hygienist will remove plaque, tartar, and bacteria on all surfaces of the exposed teeth. The hygienist will also use special instruments to clean below the gums to remove debris that cannot be reached during your regular home care. Removing all of this bacteria described is important to prevent it from entering your bloodstream and contributing to other health issues. Following the cleaning, your dentist will check for cavities as well as oral cancer, and thyroid enlargement to help you maintain a good state of oral health and aid in early detection of other health issues. More often than you might think, a dentist is the first healthcare professional to recognize signs of other health issues that have oral manifestations such as diabetes, oral cancer, and stress problems. The start of a new year is the perfect time to focus on both your oral and overall health. Most insurance plans renew on the 1st of January which provides a fresh set of benefits to utilize to help cover the cost of dental treatment. January is also a great time to sign up for a dental insurance plan if you don't already have one, so you have the whole year to utilize it and get the most out of your benefits. If you do not have dental insurance, we advise you not to let that be a reason to avoid going to see your dentist. Most dental offices, including ours, have options to help patients pay for treatment. We understand that paying for regular dental visits may be hard to fit into a budget. However, if you think in a long term perspective, seeing your dentist regularly can actually save you money. Having a problem recognized in the earlier stages and preventing the spread of larger oral and overall health problems is less costly. For more information about the payment options available at our office click the New Patients tab above. You will find information about our in house Gold Card Savings Plan, as well as other options available to you. Braces are a common part of many teenagers’ life experience — but not every bite problem is alike. Sometimes, there’s a need for accurately moving only a few teeth while making sure others don’t. 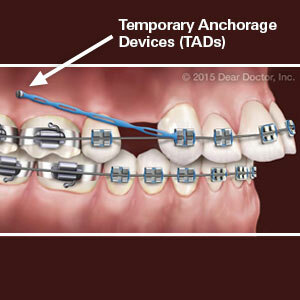 This is where Temporary Anchorage Devices (TADs) can help streamline that effort and even reduce treatment time. Orthodontics wouldn’t work at all if we didn’t already have a natural tooth movement mechanism in our mouths. That ability rests with the periodontal ligament, a tough, elastic tissue between the teeth and the bone that firmly attaches to both with tiny collagen fibers. Though quite secure in holding teeth in place, the ligament attachment also allows teeth to move in response to changes in the bone and jaw structure. Braces are made of brackets cemented to tooth surfaces through which tiny wires pass. The wires are anchored, usually to other teeth or groups of teeth, and tightened to apply pressure against the other teeth. The ligament does the rest: as the teeth are “pressured” to move in a certain direction, new bone, ligament and an anchoring substance known as cementum forms behind it to secure the tooth in its new position. The anchorage teeth are not intended to move. In some situations, though, it’s difficult to keep them from not moving — much like trying to keep a boat anchor from not dragging through sand on the sea bottom. TADs help alleviate this problem: it’s a mini-screw or mini-implant that’s temporarily placed in the jawbone to which the tension wire can be secured. They’re placed in the best positions for isolating the teeth that need to be moved without compromising the position of nearby teeth that don’t. With the site numbed with a local anesthetic, we install the TAD through the gum tissue into the bone with a special device; their screw-shaped design holds them securely in place. 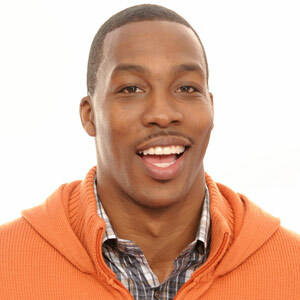 They’re then removed when the orthodontic treatment is complete. While a simple procedure, precise placement requires collaboration between the orthodontist and the oral surgeon or dentist who installs them. They also need special attention during daily hygiene to keep them clean. Still, with difficult bite situations they can help bring about the right outcome — a straight and beautiful smile.